Yeah, it was good. I wanted to get the win, but obviously everybody knows it’s Vegas and outdoors is really close. In my situation with the championship already wrapped up, nothing’s really on the line. As long as things were within grasp I wanted to try to get that [season win] number 10. And they were. Made some quick moves and then made a couple big mistakes and I was able to still stay up there but it cost me some time, and then just ride a pretty solid 20 laps. Where were you off the start? I didn’t even see you and then you were, like, third. I think I was sixth or so. Where did you pass everybody? Me and [Ryan] Dungey hit in the first turn. We actually would have been okay but we hit and then the guys on the outside came in on us. So it kind of held us back from really getting on it down the straightaway. And then you passed three dudes instantly? 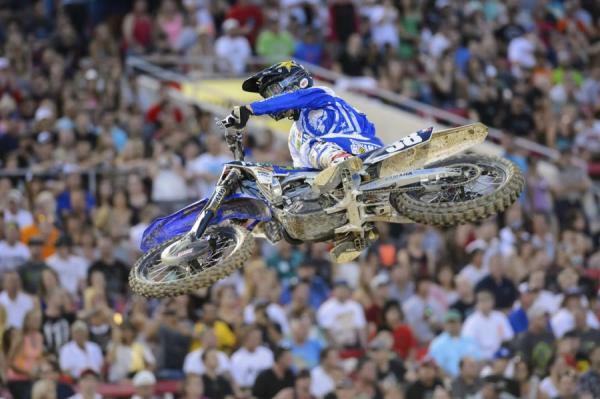 Yeah, [Weston] Peick was there. I think it was all in the first rhythm section. I think Andrew Short was up there, and then you went by them all. Yeah, it was definitely a lot better. I would have liked to start off that way rather than end that way. Nevertheless, it was a lot better for me. Got a good start in my heat race, and then rode pretty well in that, kind of gave me a little fuel for the main event. Holeshot again, got passed a few times, and then just did the best I could. But I did ride a lot better than I have been. Can you even point to what’s different from, say, five weeks ago? No, it’s just getting your mind right and getting back in the game. I was sick for a little bit then I broke some ribs. Just had a little bad streak there and it was tough to get back to it. I was just struggling. It was almost making it worse, because I was doing bad so it was making it worse. Just getting my mind right, I guess, and getting good starts and wanting to do good. At the track all week do you know that you’re off from where you were before your injury? Or is it all at the race stuff? Well, no. You know during the week for sure. But it wasn’t like during the week I was slow; I’d get on the bike and wasn’t always comfortable and I was just fighting it. It was just tough. You won the main event. That’s all you were worried about. You just wanted to win the race? I did my job, I won the race. Got off to a good start. Went in a little bit hot into the first corner. Kind of bounced off the bales; I even felt someone tag my rear end and I was like, oh boy. Could have been over right there. Got a little shuffled back and took me a few laps to kind of get my groove on, you could say. Then the, I guess you could say, ET burners turned on and made a couple passes here and there. 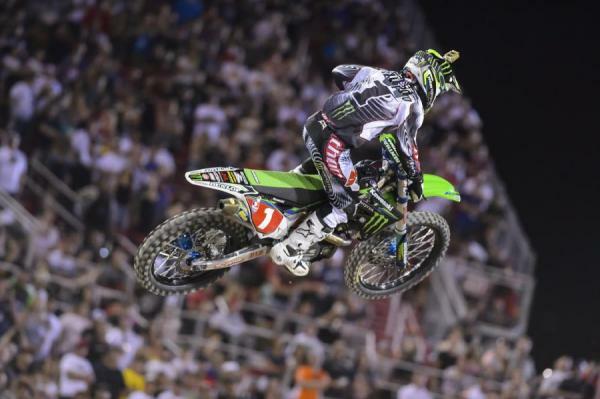 I made one or two passes after the finish line, and then Davalos after the second set of whoops. That pass in the second set of whoops, there was a lapper down there I think, too. Yeah! I was like, ‘Oh gosh!’ I was making sure he was far enough. I almost thought I was going to maybe run into him, but he got out of the way. So that was good. 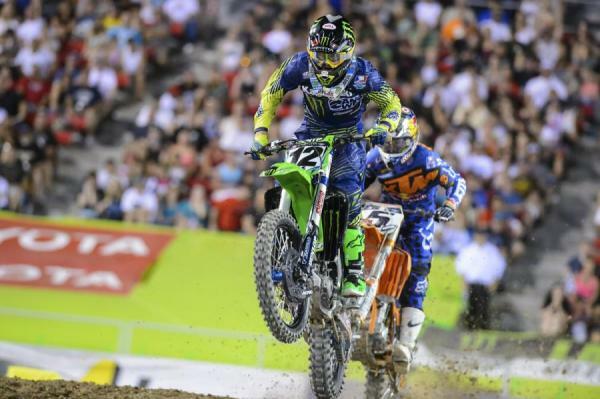 At that point I was just, come on, Martin [Davalos]; hang in second, hang in second! I heard the crowd go “Oh!” And I was like, ‘Oh my gosh,’ no, myself. I did what I could and Kenny obviously did his job too. I guess he made it happen. Do you have an idea of what’s going on out there? Oh, totally. Once I got to the lead then I was like on the radar. I checked back one or two corners, kind of looked in the lane. I was like, man, I think Martin might hold him off. It didn’t happen, but things happen for a reason so it is what it is. Obviously you’re not happy to lose the title, but does it make better to be like, okay, at least I ended it good? I know my speed is back to where it was in the beginning and all that? I did ride like my normal self at the beginning of the season. Oakland I threw away too many points. Last weekend in Salt Lake was shoulda, coulda, woulda. Could have got a few more points. 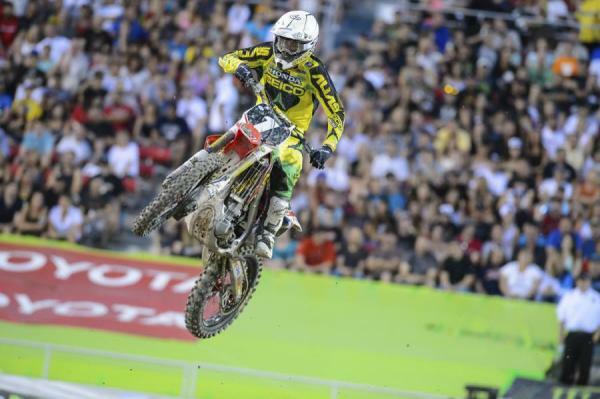 But, I mean, Roczen didn’t even make the main, so what else can I ask for, really? So last week there’s two theories: you either didn’t get the whoops right and then everyone’s like, no, he choked, he choked. So explain your side of that. Well, the first thing after the race I didn’t look at a single motocross website. I didn’t want to look at any media whatever. I’m part of the media and I would recommend that. I don’t want to look at anything. I don’t want to have anyone’s thoughts in my head other than my own. So there I was just totally struggling in the whoops, obviously. And for me it was my setup. Because I just showed tonight that I’m not that guy that I was last week. I’m not that bad of a rider. And in the main event the whoops got just really slick and cupped out, and my bike was just losing drive and my front end was diving. I thought my setup was a little bit soft for when the whoops get that spaced out and big. You got to have a stiff setup that holds up. So when I was going through those in the main, the first couple of laps I was just getting sketchy, kind of like losing my feet off my pegs. I’m like, I got to do a checkup or I’m going to wad it. Or I could go for it or crash and then I’d look like a real idiot. I know what happened and people can say I choked but I personally don’t think that I choked. Yeah, you know what’s going through your head. You didn’t feel more nerves than usual? I could either pin it through there and maybe get it, but I really thought I was going to hold onto my motorcycle that night through the whoops. And this performance here, you passed a lot of guys, and you won the finale when you had to win. Doesn’t that kind of prove your point? Exactly. There was just as much pressure as there was Salt Lake. I had to go out there and do it. And the shootout, what happened there? I tried to go a little bit inside on the start a couple more gates over. If you go look at the starting gate it’s like starting on concrete. Somebody has a picture of it; it’s really bad. I spun to the moon. Didn’t really move. At that point I was probably in 10th. Got passed by a couple of guys and got shuffled back and at that point when you’re in 10th in the Shootout you’re like, I think I’m going to stay safe for Hangtown now. Go out there for the soul ride. So everything’s good for that? Have you been doing outdoor stuff on the 250? Yeah. Got a couple 250 tests in and I”ll be in California next week. And the allergies - where did that come from? Did that affect you during the race? No, after the West Coast main I just started sneezing my head off. Allergies and dirt in my eyes. But in your shootout you were okay during that? Were there setup changes between Salt Lake and here? Did you change stuff based on that? I actually did. I went back to the stuff I won on early in the season. We actually tried to make the bike better during the break and I guess in the racing situation that bike wasn’t better for Seattle and Salt Lake and I went back to my California early round bike. It was better on the test track, though? In certain areas. I thought the bike was better on the starts. We thought it was better. And then Wil was proving that that setup was working on the East. He was running the new setup? The new setup that I actually didn’t ride. So that showed that you got to fit the bike to the rider and not everyone can ride the same bike. You did get good starts though at Seattle and Salt Lake. The Shootout was good. We got off to a couple good starts tonight. I wasn’t too pumped about the way I rode in the main, I was a little too tight at first and a little too late on my push at the end. But man we regrouped and went out for the Shootout and I got a good start and it was fun up there battling with Kenny and Marvin. They were both riding really well and going back and forth. I ended up making a pass on Marvin and ended up riding a solid ten laps. I put in a good second, and it’s nice to end the season that way. Going into outdoors, I’ve been feeling really good. Vegas has always been good for me, and the dirt is just like what I used to have at my house. I grew up riding on that. The team was working really hard today; we had one little issue and had to do a motor change in practice. Man, all the guys, Ryan Morais, Bobby Regan, Brad, my mechanic Sean, the whole team has been great in sticking behind me and I’m keeping my head up and pushing through stuff. We had some ups and downs, some good results and some bad ones, and it’s nice to end supercross on this note and go into the outdoors with some confidence. It was getting dusty out there. Was it slippery?